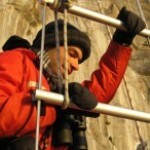 The Ocean Gazing podcast is produced and hosted by Ari Daniel, and is a project of COSEE Networked Ocean World. Ari Daniel has always been enchanted by the natural world. As a kid, he packed his green Wildlife Treasury box full of species cards. As a graduate student, Ari trained gray seal pups (Halichoerus grypus) and helped tag wild Norwegian killer whales (Orcinus orca). These days, Ari is a science reporter, and he records a species he’s better equipped to understand – Homo sapiens. He uses radio and multimedia to tell stories about science and the environment on public radio and online. In the fifth grade, Ari won the “Most Contagious Smile” award.